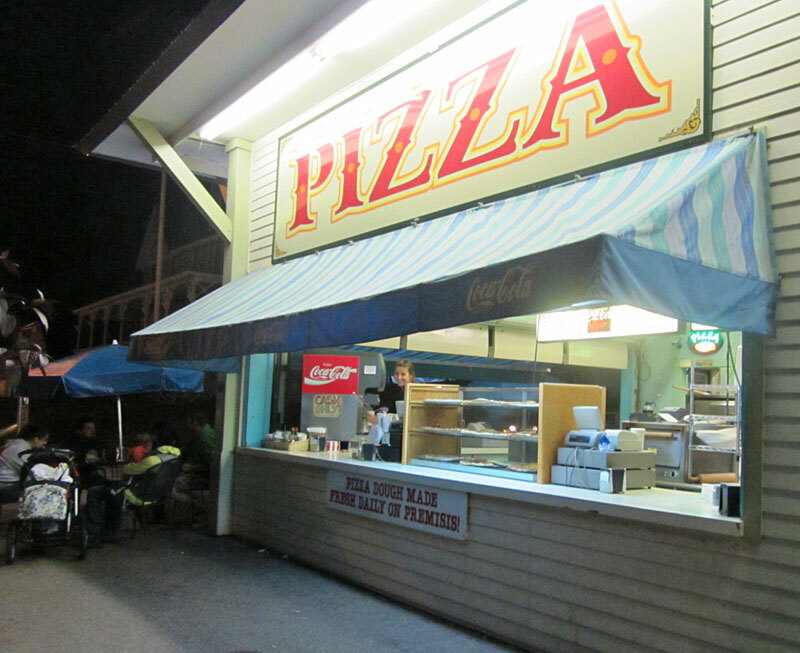 For over 40 years, we’ve been selling the best pizza in Weirs Beach. When we started making pizza in the early 1960’s, we learned the old-fashioned method straight from Italy, and we haven’t changed that simple recipe through all the years. First of all, we start with an absolutely delicious handmade crust. Every day, we make a fresh batch of pizza dough. Then, we hand toss and stretch out every single one of our pizza crusts. We don’t use a frozen, machine-made crust like many places do today. Then we add our specially made, rich tomato sauce. It spreads evenly and sticks well to the crust. 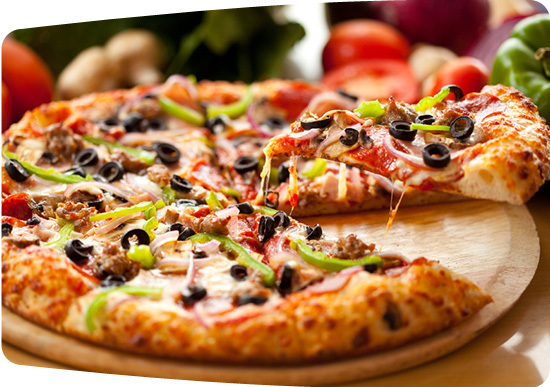 The sauce is neither runny nor thin-tasting like other familiar pizza brands. Finally, we top off our pizza with the finest Mozzarella cheese. There are many varieties of Mozzarella that will make an acceptable pizza, but we are extremely picky about the cheese we use. For us, only one particular kind of Mozzarella, of the very highest quality, will do. We do believe in the basics – toppings such as pepperoni, onions, mushrooms, or peppers – and keeping it simple, so you can still taste the great pizza underneath. But we also provide a wide selection of ingredients for those whose tastes are more varied. Try putting together ham and pineapple, chicken & broccoli, or your own combination. Other toppings, such as feta cheese, sausage, bacon, etc., are available. 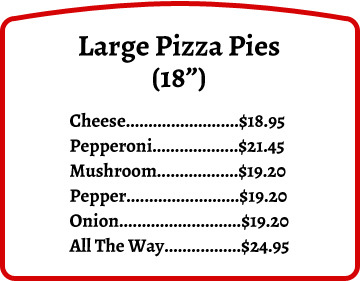 Our whole 18″ pies are divided into eight slices. Because of the thickness and quality of our ingredients, for the average appetite, one slice will satisfy you for a snack; two slices will be a satisfying lunch; and three slices, a satisfying dinner. 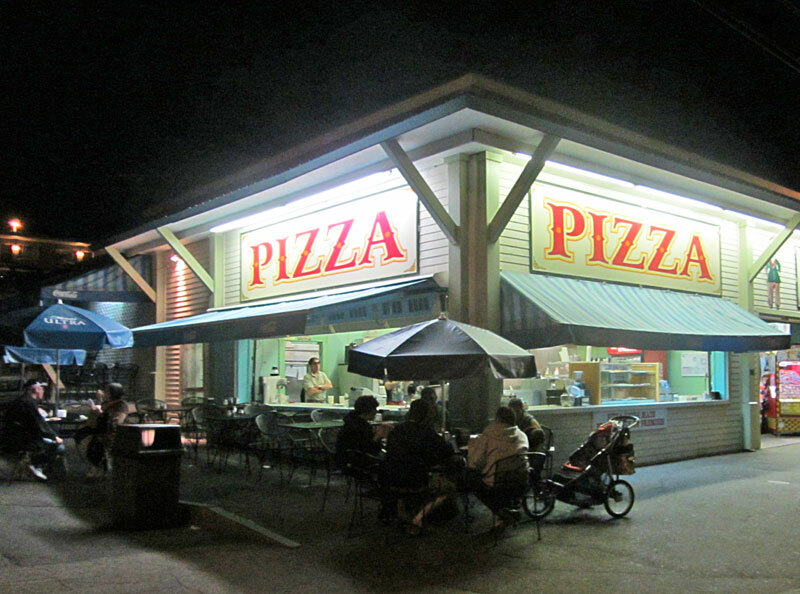 In 2009, after nearly five decades selling pizza and ONLY pizza, we greatly expanded our operation. Now, we offer a full compliment of all the fast foods that you would expect at your neighborhood Pizzeria, or at a summertime, beachside snack bar: Fried Dough, Subs, Burgers, Dogs, Salads, Chicken Tenders, etc. In 2009, we also expanded our outdoor seating. So please come check us out! Our phone number is 603-366-4380 if you have any questions. However, please do not call us for take-out – we do not accept orders over the phone! Sorry, no phone orders please! For over 100 years, Coca Cola has been sold on the corner of New Hampshire and Lakeside Avenues. Enjoy an Ice-Cold Coke at the Half Moon Pizza stand!